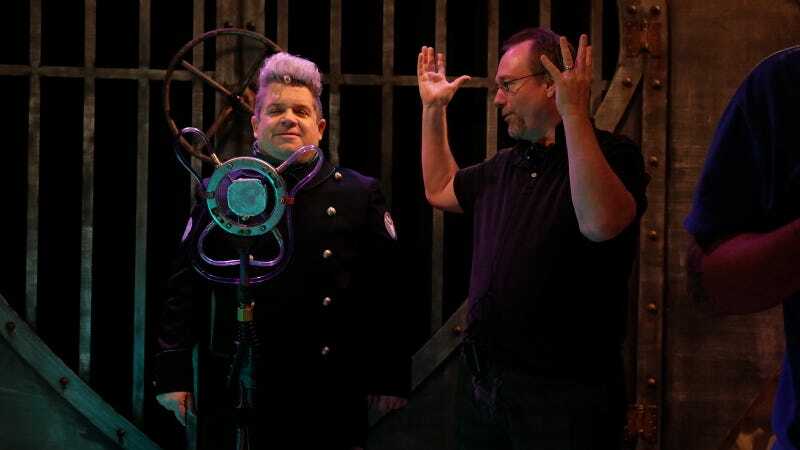 Patton Oswalt and Joel Hodgson. All images: Netflix. In just about two weeks, Mystery Science Theater 3000 returns to TV, courtesy of Netflix. Usually bringing back something so beloved by fans after so long is an attempt to meet impossible expectations, but creator Joel Hodgson and the show’s new cast and crew have pulled it off. The original show began in 1988 and ran for a total of 10 seasons over 11 years, with a feature film in 1996. We talked to Hodgson about bringing MST3K back—thanks to a highly successful Kickstarter campaign—as well as the philosophy that keeps it timeless, and what the future holds (including, hopefully, 100 more episodes). io9: When you launched the Kickstarter, it did amazingly. You’ve managed to get stars like Patton Oswalt and Felicia Day on board. Netflix picked up the new season quickly. Are you at all nervous about the show’s return at this point? Hodgson: I don’t think I’m nervous. You know, there’s the known universe of Mystery Science Theater, meaning the people who are fans and the backers and people who are familiar with the show. That’s the world that I know of, and my job was to think about them and try to make it so the new Mystery Science Theater made sense to them, and worked for them, because I obviously really wanted it to. That was a big part of it. And then there’s the unknown, which is, what will new people think of MST3K? And that’s just something that I can’t control. But I tried to re-jigger the design so it would work for new people, so they could understand it and navigate the show, while also working for the longtime fans, too. Hodgson: We screened [the new episode] for about 1,500 people, in New York and Chicago and LA, and I got to meet a fair amount of those people afterward. I guess I probably got to talk to about 900 of them and asked them very directly what they thought. And there wasn’t a single person that didn’t like it, and didn’t appreciate the direction we were going. So I felt very lucky that way. So that kind of confirmed that we landed it. Getting back to your question, I was much more nervous about that and hoping those people were satisfied. And I kind of used them as a bellwether or barometer. By and large, I think most of the people who liked the show will like this. How long has bringing MST3K back been on your mind? Hodgson: At least the last seven years, I think. I went back in my notebooks and basically, it was seven years ago when I really started writing down stuff for the new MST. I think it was something like that. Maybe a little bit further back, but, I think so. You and Shout Factory partnered up to get the rights back to the show, which allowed this revival. Can you talk about how that came together? So, that had a lot to do with it. And also, the good thing is it created a relationship with these people buying DVDs over the years. And people really like them. They did a good job. How concrete were your plans for the show? Did you ever have any thoughts about hosting it yourself? Hodgson: Well... I guess in my mind, I just always assumed that we would put in new people. I guess I grew up in an age where I saw a lot of old comedians and there’s just kind of a freshness date on comedians, and when they get to a certain age, and they don’t realize it, they can become irrelevant? So I was always self-conscious about that. I also wanted to really treat it like a design experiment: “How do I make Mystery Science Theater a little bit easier to understand for people who aren’t familiar with it?” I tried to come at it from that direction. I only got to see the first one. I’m a huge fan of the old show, and I knew the new show was going to be different in some way. But even with the differences, it felt like Mystery Science Theater. It felt right to me. Hodgson: Oh, good. That makes me really happy. I really appreciate it. It’s always so tough to bring something back like this, because so many fans want it back exactly as it was. But if you do that, it never works. How tough was that to plan, or prepare for? Hodgson: I really like the way you phrased it, because, you can’t control it. And it’s just not my style to control, to over-direct. I just try to give people a certain amount of autonomy. Because I think that’s where they’re happiest. They get more invested. Here’s how I did it: I just kind of said, I think Mystery Science Theater works, because it’s a document. It’s a document of a couple of days in this group of people’s lives who are making the show. And if we treat it as a document, we’ll be okay, because it’s a picture of us and what we’re doing. You know? It’s almost like taking a family photo. They’re never perfect, right? But that’s what I love about them, right? And that’s how I dealt with it. I [told the crew], “Look, I don’t want you to think about how this is going to feel for people watching it. I want you to think about us documenting ourselves, and just being ready.” And as you know, there are no digital effects. There’s very little processing. There’s very little editing. And what you see is this pretty pure kind of thing. It’s almost like Saturday Night Live, in a way. The way Saturday Night Live has a mortality to it, because it’s a document. And I think MST is similar in the way we record it and edit it and stuff. It almost feels like a live sketch. So you’re worried about just making the episodes, and not the show’s legacy. Hodgson: Yeah. You can’t control that. The big job is movie riffing, and that’s something you can control. You just can’t control how people feel about it. So that’s really their responsibility. And if the audience chooses to meet you, they grab it and carry it. You know what I mean? But I don’t really think if it in terms beyond the experience of riffing a movie and trying to be funny in the context of the show. It’s just... I’m really grateful that people like it. But, it’s not because I designed it in there. You know what I mean? It’s just a happy outcome. I never really thought about how carefree Mystery Science Theater 3000 was, but the new series really captured that. It felt unburdened by all the history and expectations and legacy. Hodgson: The people who are talking about the legacy are the people who don’t have to make it. Believe me. The people doing press, or the executives who are hyping it...it’s not the people who have to make it, because if worrying about it like it’s a legacy, they’re not going to get anything done. You know? Getting back to the original idea for the new series, were the new Mads—Kinga Forrester and TV’s Son of TV’s Frank—always part of the plan? Or did they come about after you signed Felicia Day and Patton Oswalt? Hodgson: I always felt like the experiment was going to be Kinga Forrester, who’s Dr. Clayton Forrester’s daughter and Pearl Forrester’s granddaughter. But when we were starting, right before the Kickstarter, I was planning on [original villains] Trace Beaulieu and Frank Conniff being part of it. We were planning on doing the Kickstarter video and we were actually planning their travel and I had written them into the script for the Kickstarter and so, it was going to be Forrester and Frank and Kinga—and also Mary Jo Pehl, who played Pearl. They were more like an ensemble and Kinga was more of a reluctant super villain-in-training. And just before we shot the video, for different reasons, they couldn’t be part of the Kickstarter. Trace, Frank, Maru Jo, etc. And so, I had to kind of change my posture because I realized, “Oh, all-new people we’re just going to have to proceed with...” and lean more strongly on Kinga, Jonah Ray, and the ‘Bots. So I was really faced with that. I knew I’d have to get a second banana for Kinga, and I was already wanting to use Patton. He just dropped in and it was fantastic. As you can see, they’re like, unbelievable together. It’s really crazy how good he and Felicia are. Does having Shout Factory and Netflix on board affect the movies you’ve selected for the new season? Hodgson: Oh... I pretty much curate what movies we’re going to get. I work with Shout, obviously, because they have so much experience clearing the rights for these films. I started with a wish list and then we proceeded from there. That was another great thing about the Kickstarter—it gave us a budget to get nicer-looking films. The sound isn’t scratchy and the picture hasn’t got a lot of scratches. Stuff like that. We’re just trying to get better prints than we’ve ever had, because people’s TVs are so much better. Of course the new episodes are in widescreen, but I admit it was kind of surreal to see the silhouettes like that. Was that a difficulty or a necessity or what? Hodgson: In fact, the silhouettes right now are very similar to the size of the silhouettes I had when we did the original series at KTMA. I have the silhouette much smaller, and the seats much smaller... and I like it that way, because you can see more of the screen. It looks like a movie theater. Given that the new series is on Netflix, and has no commercials or time constraints, I didn’t expect that it would still stick to being 90 minutes long, with three host segments in the middle, and even bumpers for commercial breaks. Why do that? Hodgson: I love those little remnants that are in TV shows, like, they’re going to a commercial break. If you watch The Walking Dead... there are moments where you know it’s supposed to go to a commercial. You can feel it. And it doesn’t. But it’s a little reminder that, “Oh, they were going to go to commercial there.” I really love that. And I think it’s good for the viewer. It’s a little bit of a palette cleanser. And it was also kind of a remnant from the original show that I was trying to send a little love tap to people who were longtime fans and watched the shows on VHS. And in the narrative of the show, Kinga’s kind of maniacal and wants to blow up the brand, and so she’s using that to kind of reinforce that you’re watching this slick TV show, and they have a house band... they’re promoting it back to you as you’re watching it. You know? So what does the future hold? MST3K seems so modular that, if for some reason, Felicia or Patton or Jonah had to drop out, someone else could come in. and the show could continue forever. Hodgson: Yeah, I always assumed that it would be that way, even when I was performing it. This is weird, but I was always really proud of the concept. It’s not like I got the concept from some place, I created it, and I was like, “This is original, I’ve never seen this before...” and I was really delighted and happy when it worked, but I think it can be refilled. It’s meant to be refreshed. It’s okay. It’s designed like that. That’s my take on it. I think my deal with Jonah was “let’s try to do 100 episodes if we can,” and then after that we have to get a new person in there. So I think even he knows that. Because he’ll have the good fortune to make all those shows after that that somebody... downstream will do it. Hodgson: You know, it’s funny, but [I fall in love] with every movie. You have to spend so much time with them—especially in the new season, because we had to take a lot more time with each movie, just because we were figuring out technically how to do all the writing again and then figuring everything out. MST3K arrives on Netflix April 14.